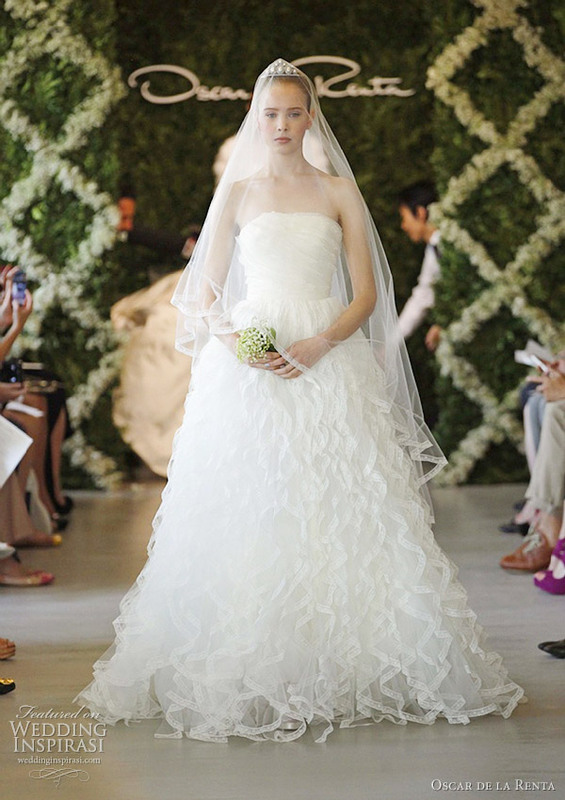 Wedding dresses with dramatic edge from Oscar de la Renta Spring 2013 bridal collection. 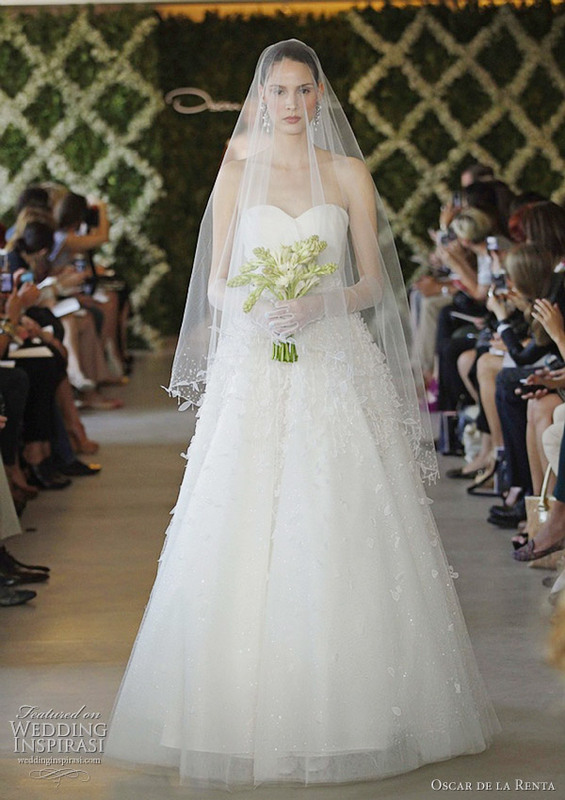 Loving the beautiful explosion of tulle, lace and color. 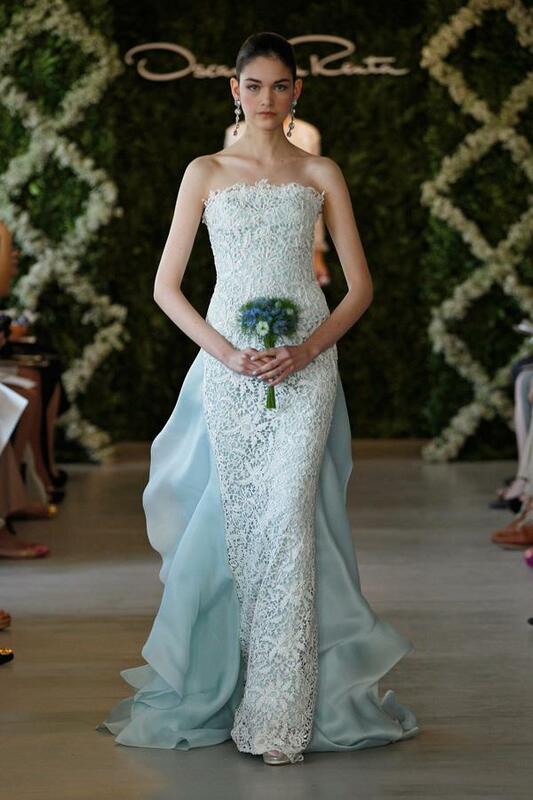 Above, gown with voluminous tulle cape; below, strapless gown with tiered overskirt in light blue. 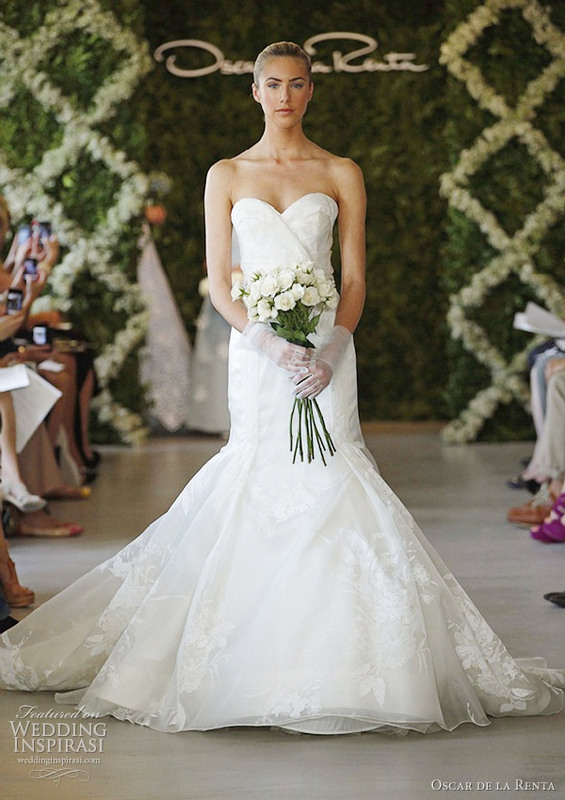 Strapless sheath with sweetheart neckline. 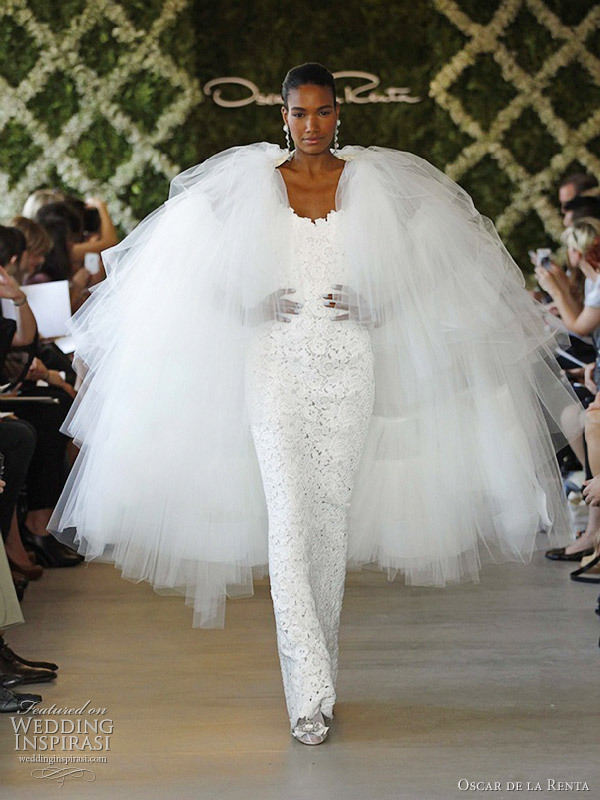 Fashion shows fit into one of three categories: the fun, the brilliant, and the everything else. Most fall into “the everything else”, which is disappointing but not surprising given the sheer number of presentations (there are 300 per season in New York alone). 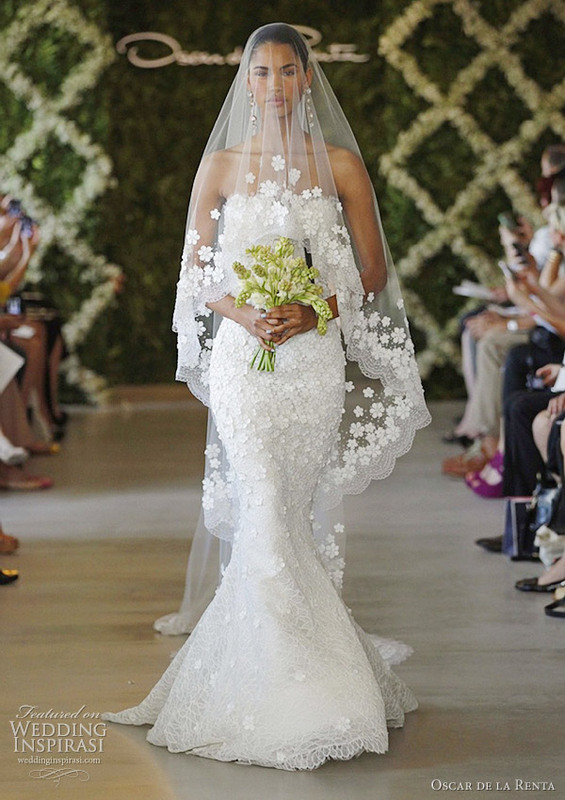 But bridal week is different. There are dozens, not hundreds, of shows. 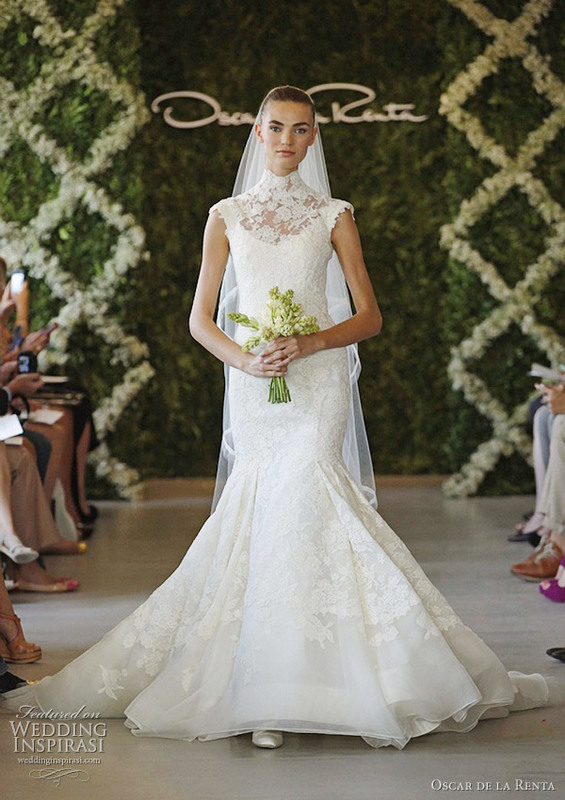 Celebrities rarely attend, and neither do big-name fashion editors or street style stars. Guests don’t look each other up and down. It’s nicer. It’s prettier. Being cool is not a concern. 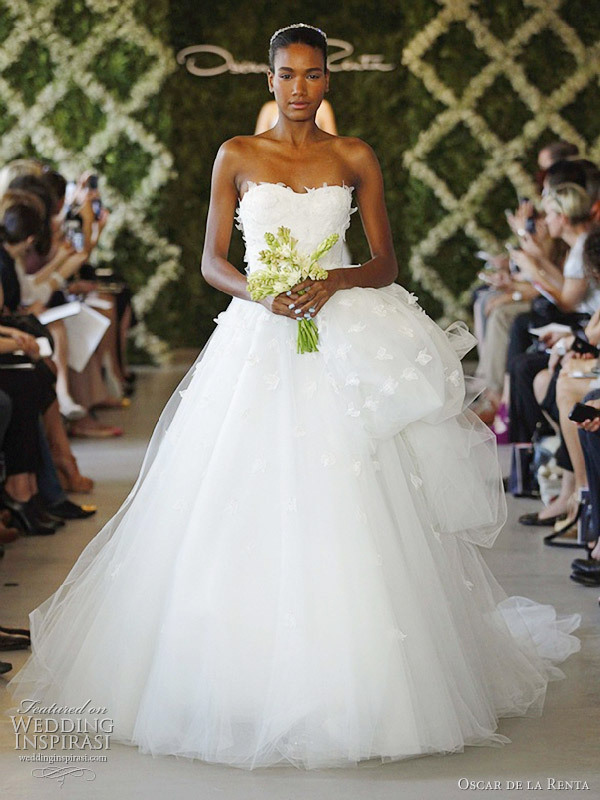 Yesterday we attended the Oscar de la Renta spring 2013 bridal show (yes, bridal collections are shown a full year in advance), and it was lovely. 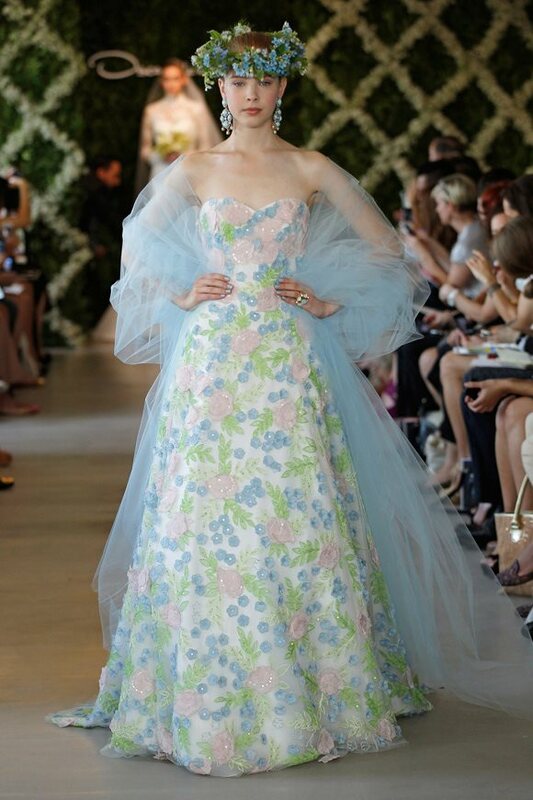 The unseasonably warm weather translated into less-than-ideal temperatures inside de la Renta’s 25th floor showroom, which meant a prompt start was much appreciated. 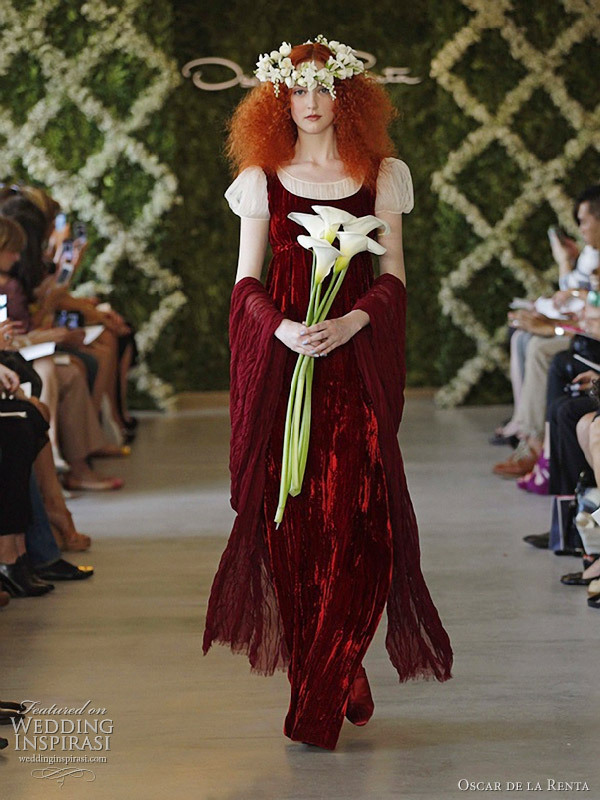 The venerable designer put on a dramatic show, which opened and closed with blood red looks. 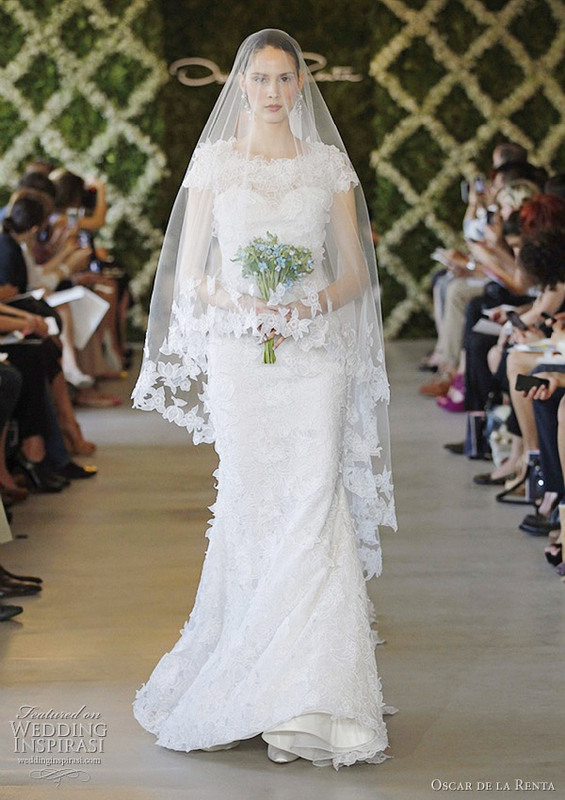 Traditional white dresses were maximized with insane tulle capes, voluminous skirts, and intricate detailing. 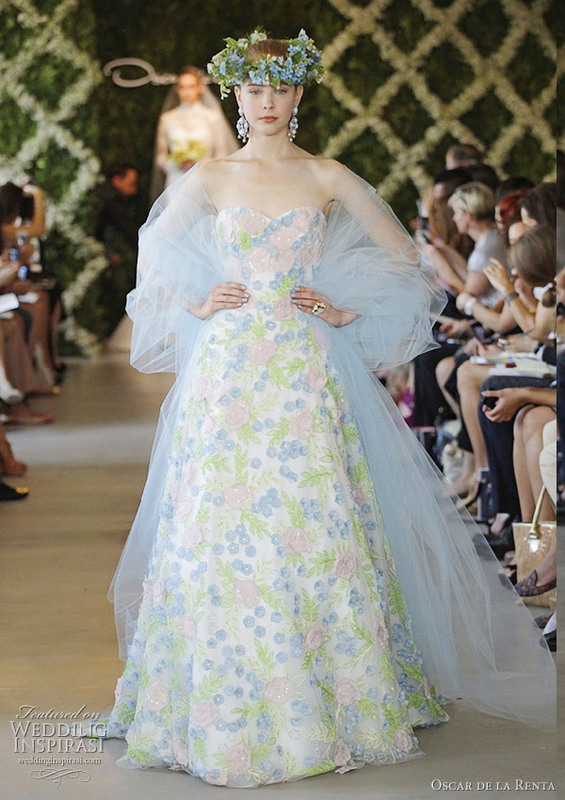 “Something blue” was found on a quite a few of the gowns, a winking reminder that romance need not always be so serious. A bandeau pantsuit achieved the same effect. 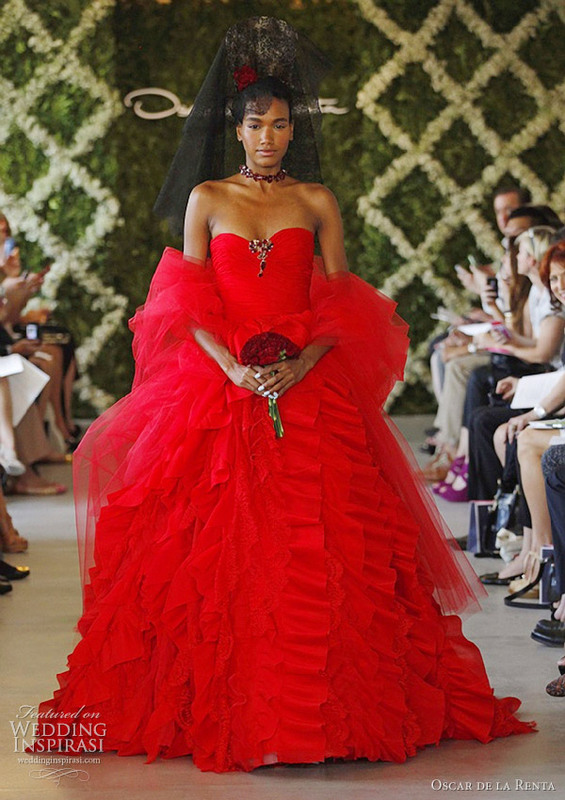 And the charm didn’t end with the clothes — de la Renta took his bow with the flower girls. Yes, it was all quite lovely.